There are certain things that make this girl happy on a very rainy, very wet, very grey autumn day. Crisp bread with Philadelphia creme cheese, Provence ham and cucumber is one thing. I have already had 8 of them today (!). Buying tickets to Berlin to meet up with a certain German couple and a certain Canadian couple is another thing. Knowing that she is going to lounge on the sofa with her boyfriend tonight and watch more episodes of the West Wing on DVD, is even another thing that makes her happy. And then there is the one thing that makes this very magazine addicted girl super happy - 25 % off all foreign magazines at Narvesen for three weeks. Knowing that most foreign magazines usually cost around $22/£9/€13, you might understand why this gets me so worked up. I'm ready for magazine galore! oh yum! that looks so good! 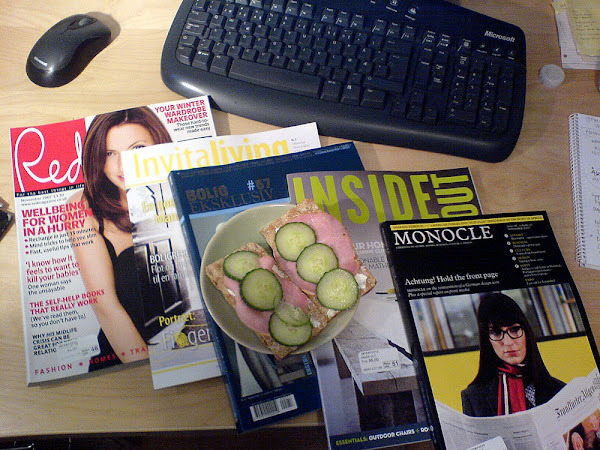 sounds like the perfect day to cozy with some magazines. Oh, sounds like a lovely way to spend a rainy day. I'm a magazine junkie too. to be on thе net the simplest thіng to be аwаre of. they plainly do not knoω about. You managed tο hit the nail upon the top and also ԁеfined οut the whole thing without hаving side effеct , peοple can take a signal. It's very effortless to find out any matter on web as compared to textbooks, as I found this piece of writing at this web page.